Original 1895 design blended with new facade of iron spot brick in smooth | velour | artisan finishes in running | stack | soldier | bonds to show off masonry craftsmanship. Elements in relief cast intricate shadows across one another in playful jazzy rhythm. Standard size Ironspot brick in three finishes were laid in three bond patterns to create a great visual effect. Soldier brick became dramatic as they were laid on a 30° angle to the face of the wall. The top row was centered on the brick row below. Challenging. But the skilled craftsmen soon determined a system to make it work seamlessly. Laying brick in this fashion required a bit less mortar. After laying a couple brick, they had a feel for it. The size of the mortar joint had to be uniform. This feat is now a source of pride for the skilled bricklayers. Bragging rights. A contemporary interpretation of classical layering manifests itself in the brickwork encompassing three bond patterns: running, stack and soldier. 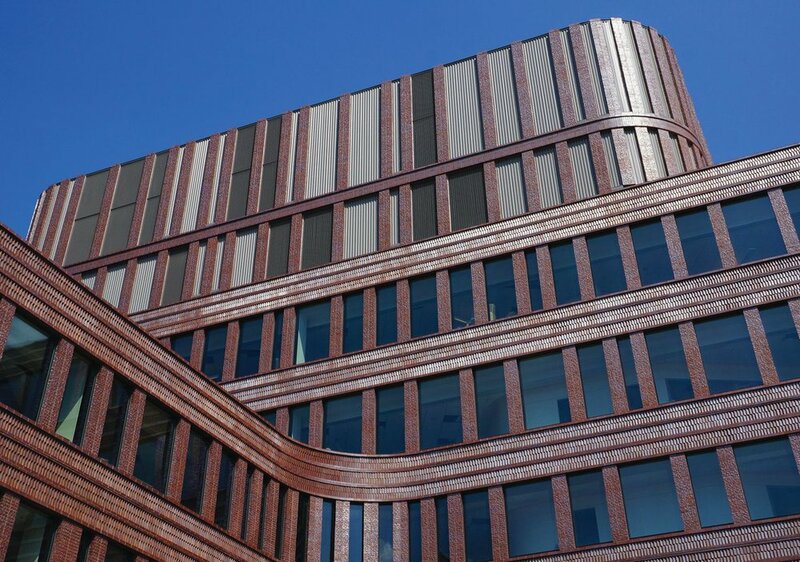 Vitreous properties of the iron spot brick in smooth, velour and artisan finishes reflect light in different ways depending on the weather conditions and position of the sun. The oldest cities in the US have a rich tradition using brick. The design team wanted to use it on the Bruce C Bolling Municipal Building to show of the craftsmanship of bricklaying, while simultaneously unifying the existing historic portions of the façade with the new. Brick allow for a contextual, sinuous, modern response, which speaks to craftsmanship, context and timelessness, while providing a durable, sculpted response to the existing historic district. Elements in relief cast intricate shadows across one another in a playful, jazzy rhythm. The development of the project at Dudley Square in Roxbury, Boston’s geographic center, is a critical piece in the City’s efforts to revitalize a neighborhood with a rich history. The design team worked with the local community to conceive of a building that was suited to the character of the neighborhood and helped restore its vitality. Subsequently, historic facades of three existing derelict buildings on the site have been comprehensively restored and stitched together into a bright new building. The design unites and re-engages these frontages, thereby reaching back to all sides of the city. Referencing the historic buildings, the central volume of the new municipal center embodies a time-honored approach to craftsmanship in construction. Soldier coursing was laid at 30° angle to face of wall for unique and distinctive appeal. The first is the Ferdinand Building a five-story structure dating back to 1895, constructed of limestone terra cotta, brick and granite with six large oval windows at the corners and ends of the building, as well as a large copper ornamental cornice with cast lion’s heads. From the start, this building was to be integrated into the new project. Also included are neighboring Curtis Building (1888) in Queen Anne-style red brick and the Waterman Building (1890) in Boston Granite style. This allowed a design inclusive of the three corners of the triangular plot. The design concept was to unite the three old facades into one new building. The historic exteriors are linked together by the new volume, which is discreet both in massing and material expression, using a combination of brick and glass. Bringing a large city department tenant right into the heart of the neighborhood anchors the redevelopment. This is an excellent blending of old and new. The use of multiple bonds and textures is exceptional. The strength of the project lives and dies on the detailing. 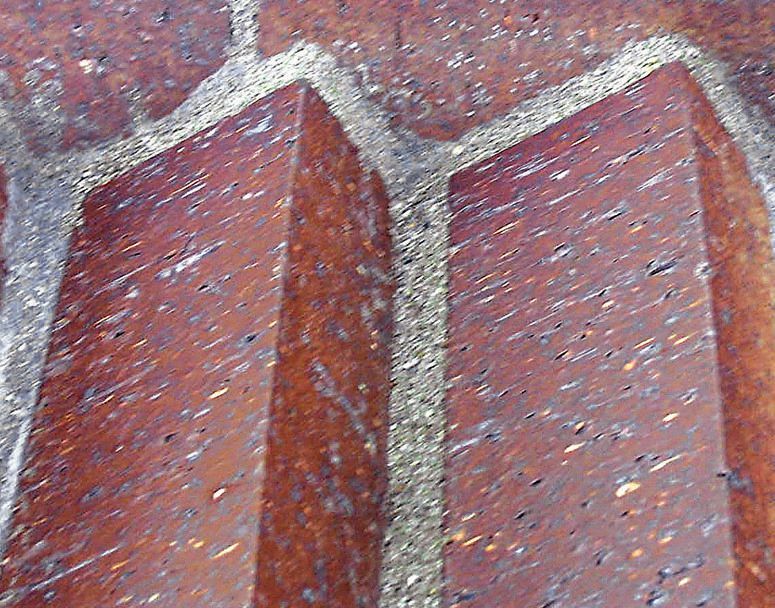 The highly textured and eroded brick of the ‘piers’ is also wonderful and acts as a slightly more organic foil to the hard edge of the other brick. The kind of clay used to make the brick, ironspot, an all natural material which inherently changes its nature depending on the angle of the sun. The intricate use of brick for both skin and ornament is to be commended. As an urban building, the massing and color is restrained and respectful of its historic neighbors. | The building combines the existing with the new in a surprisingly fluid manner with no competition between the components.